Sustainable development and respect for the environment have always been taken into account within the Velfor Group. 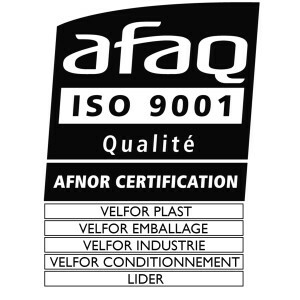 To contribute at his performance and his sustainability, VELFOR PLAST, have the ISO 9001 certification since 1998. Every the day, we acting to improve our quality management system and the tools necessary for its effectiveness. The priority of Velfor is to satisfy our customers with economical solutions according to their needs and regulatory requirements. In addition to listening and make evolving our employees by involving them and empowering them to increase their competence, we put in place on a daily basis the human, structural and operational means to answer at our sales and marketing strategy and preserve a know-how present since 1973. Every day, VELFOR PLAST, commits in a process of continuous improvement in order to improve customer satisfaction.